To make the pastry mix the flour with the sugar, then rub in butter until the mixture looks like fine crumbs. Add the yolks and the grated lemon rind, then mix a little water to get a workable dough. Leave the mixture to chill. Add the lemon rind and orange flower water to the almonds and bind with the egg whites. Roll out the pastry mix and cut out the shapes you want. When doing this cut two shapes for each figolla as they will be sandwiched with the almond paste. Lay the first shape on a floured and greased baking tray, spread with the almond paste made previously, leaving a small margin. Put the second shape on the previous and press the edges together. It would help if you were to wet the edges with a pastry brush to ensure binding. Bake at a temperature of 200°C/400°F for five minutes and then at 180°C/350°F, for about 20 minutes until pale golden. Let to cool on the tray. When cooled, coat with the glacé icing then decorate with some royal icing in an other colour, but do not overdo it and make it look gaudy. While the icing is soft push a foil-wrapped egg into the pastry. If you are making human shapes it is traditional to put the egg in the middle of the man's or woman's tummy. Then finish with some ground almonds. Since ground almonds are quite expensive some substitutes, such as tiny sugar-coated eggs can be used, although these might not be as traditional. If you can not obtain these pastries it is quite easy to make them yourself. You can also make your own templates, like sheep, out of cardboard. 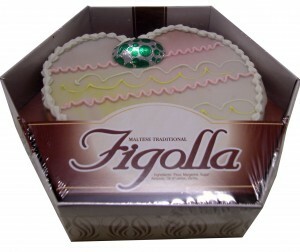 The traditional shapes of figolli are men, women, fish and baskets; the last probably being symbols of fertility. Recently new forms have been added to the traditional such as; cars, lambs and butterflies. The shapes of humans are easily identified by the old-fashioned paper faces that are stuck on the icing. Another traditional decoration is the Easter egg wrapped in bright colours. This entry was posted in By Course, By Occasion, Desert, Easter, Recipes, Sweets and tagged food, helu, Recipes, sweets, traditional maltese recipes. Bookmark the permalink. 1. Place the sieved icing sugar in a mixing bowl, add the water and any flavouring or colouring and beat until smooth and thick enough to thickly coat the back of a spoon. If you find the mixture is too thin, add more sieved icing sugar. If it’s too thick add more water a few drops at a time as a little liquid goes a long way. check out the last newsletter – or order them online and we will deliver! I make these every year for easter but I cram as much filling in as I can, yummo! !